When it comes to abc worksheets, they shouldn’t look the same after the kids work on them as before. Oh, no! Especially this one. Kids get to trace and write, identify the letters by circling them, coloring the letters (will it be in just one color or all the colors of the rainbow? 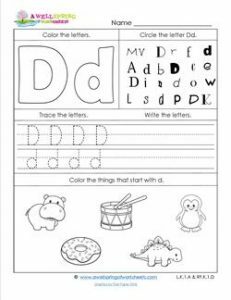 ), and coloring the objects that begin with d. Be sure to have kids write their name on the page first thing because you will have a bunch of pages that are beautifully done.